Our neighborhood association is hosting a neighborhood clean-up day this coming Saturday so we've decided to get our act together and clean up all the misc. building materials which have been accumulating in our garage and yard. So our project this week is to get this stuff out of here! We have a pretty large stack of wood window frames leftover from when we took out the glass for the leaded glass windows; those are going. And we have various metal bits all over the place, and they'll also be going. And we've got several *large* tubs of stuff in the garage that Sharon is currently sorting and we'll likely either sell or give away the contents this week. Most of what is left in the garage at this point is salvage and we're still not sure what the fate of all the salvaged building materials should be. We'll surely be keeping the pieces that are designated for the chicken coop and garage remodel, but there is probably some of the stuff we could part with. The hard part is deciding which bits are expendable. We likely have too many painted cabinet doors; we should probably get rid of some of them, but it's hard to decide. There is always a special satisfaction when you're able to reuse something in a house remodel, especially when it seems nicer afterwards. 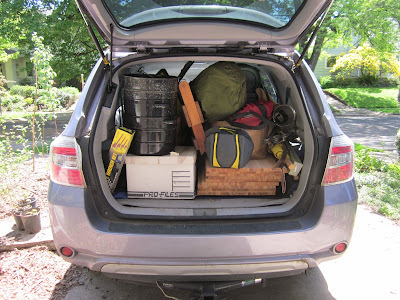 Jeff loaded up the back of the SUV and took a load of SCA gear off to storage this afternoon.